A balanced meal should have grains, vegetables, fruits and protein worked into it. A typical South Indian Tamil Nadu meals consist of rice, served with a lentil based gravy like sambar with vegetables on the side. Yogurt is an essential part of the meal. A banana after the meal is not at all unusual. So, without knowing the definition of a balanced meal, our ancestors have provided us the same! In olden days, families were much larger in number and there weren’t any appliances to make life easy. A simple meal presented in a plate had a lot of effort behind it. This explains the bigger meals as appetite is worked up because of a labor intensive lifestyle. The meals were three course. Rice is the staple food and star of the meal. The first round is rice served with sambar. The second course is rice and rasam. The third course is rice and yogurt with which you wind up the meal. For the first two courses, one or two simple vegetable preparations are on the side. Potatoes are treated like vegetables, but people are conscious of the use and don’t make it for everyday meals. It’s almost like a treat now a days. Fried papads or appalams are also served as a side. In the picture here, I have gone back to the meals we grew up eating. 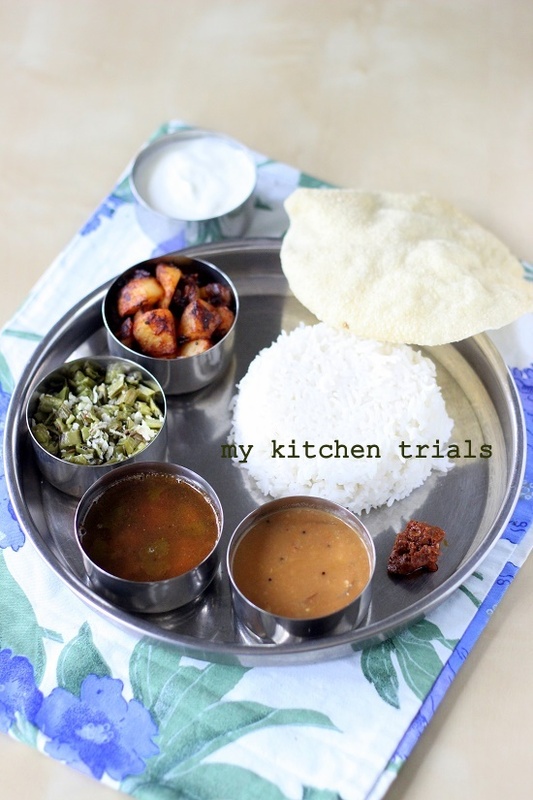 It shows rice, sambar, rasam, cluster beans porial, potatoes, yogurt, pickle and appalam. With smaller families now, the meal has simplified a lot. Most of the days, rice is served with sambar or some other gravy with a vegetable on side. Tamil Nadu is incredibly hot and so the rice and yogurt course, which helps in cooling the body, still continues. 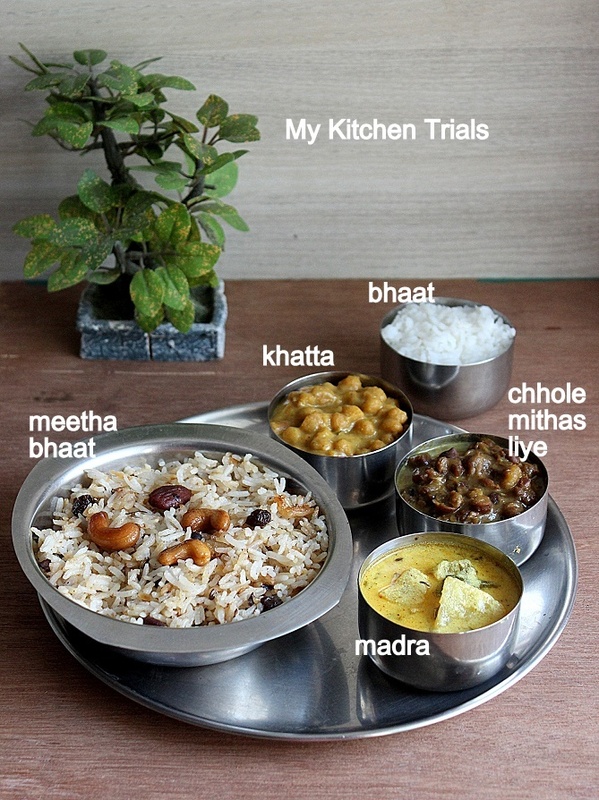 So, to this day, the meal has rice for carbs, lentils and yogurt (and meat, in case of non vegetarian meal) for proteins and vegetables and rounds up as a balanced meal. If you are wondering why I am preaching about a balanced meal here, the thing is I wrote the above as an article for Travel Secrets Magazine. It was published in Oct 2015 edition and I thought its a good idea for me to note it down here as well :D.
Cook the potatoes until its just done. Peel and let it cool completely. Dice into pieces and set aside. Heat oil in a non stick pan. Add salt, turmeric powder and chili powder to the oil. Mix it in. Wait for a few moments, until the chili powder starts to change color from red to brownish. Add the diced potatoes. Let it get coated with the spiced oil and cook on low – medium flame until its roasted and has a crispy coating. 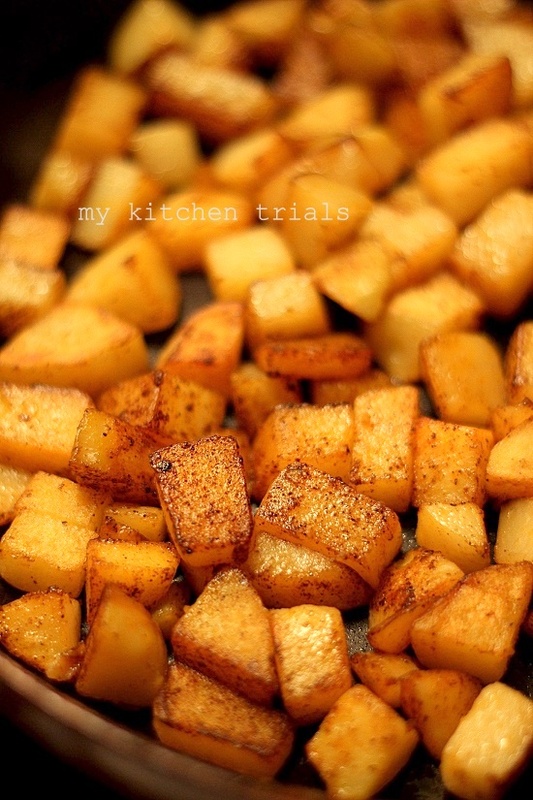 Carefully keep turning it in between so that all the sides are fried equally. 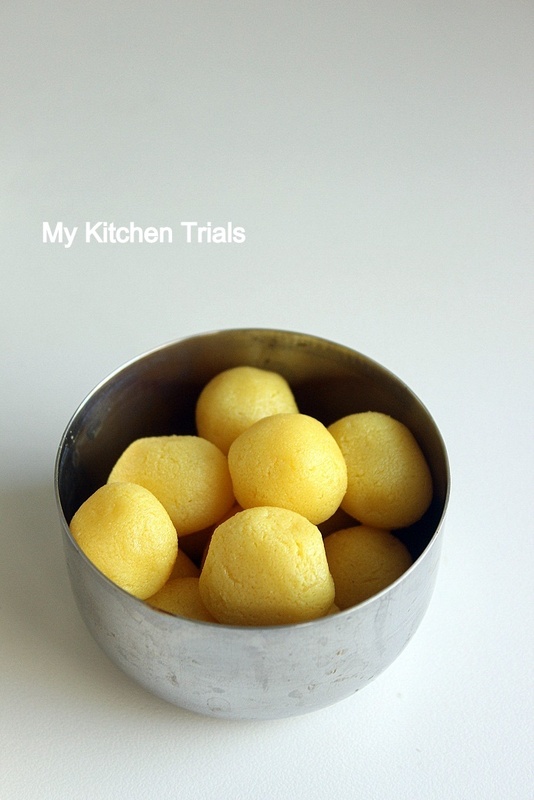 Serve with rice and sambar. A recap of the 30 day Indian Food Odyssey. Click the link/picture to go the particular post.